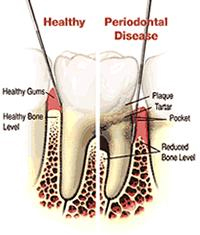 Gum disease (also called periodontal disease) is an infection of the tissues that support your teeth. It is a major cause of tooth loss in adults. 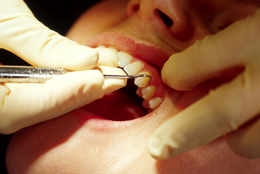 Because gum disease is usually painless, you may not know you have it. At each regular checkup we measure the depth of the shallow v-shaped crevice (called a sulcus) between your tooth and gums to identify whether you have gum disease. Gum disease is one of the main causes of tooth loss in adults and has been linked to heart disease and strokes. In the more advanced stages of gum disease, called periodontitis, the gums and bone that support the teeth become seriously damaged. Whereas, healthy gums and bone anchor teeth firmly in place, infected gums can cause teeth to become loose, fall out, or have to be removed. The early stages of gum disease is called gingivitis. This is where the gums become red, swollen and bleed easily. At this stage, the disease is still reversible and can usually be eliminated by daily brushing and flossing. Some types of medication such as steroids, some types of anti-epilepsy drugs, cancer therapy drugs, some calcium channel blockers, and oral contraceptives. A healthy beautiful smile starts with healthy gums. Periodontal disease is the leading cause of tooth loss and has been linked to heart disease, stroke and premature or low birth-weight in babies. Most tooth loss in people under 35 years of age is caused by athletic trauma, fights or accidents. Most tooth loss in people over 35 is from periodontal disease. If you have gum disease, you should change your toothbrush every 4-6 weeks, bacteria can harbor in the bristles. The latest treatment of periodontal conditions uses a soft tissue laser. Periodontal laser therapy treats periodontal issues more effectively and comfortably than ever, removing scar tissue from periodontal pockets, killing bacteria causing the disease and promoting the reattachment of the gum to tooth. Using the laser we gently disinfect and evaporate diseased tissue from around the tooth and inside the gum pocket. Our goal is to heal the gum pocket from disease and to monitor the reattachment of the tissue to a normal or near-normal depth. The laser therapy is a conservative, effective and comfortable option in treating beginning to moderate periodontal cases. WILL I NEED CLEANING MORE FREQUENTLY? With periodontal conditions teeth and gums stay in better shape when they are professionally cleaned more frequently. The infected areas are not accessible by brushing and flossing and will require us to manually remove the bacterial toxins with special instruments. The infection must be removed every 90-120 days to prevent further bone loss. We set up patient cleaning schedules based on needs, which may be cleanings as often as four times a year. Patients who have heavy plaque and tenacious calculus buildup are prime candidates for needing more than just 2 cleanings a year. Also people who are generally healthy but have certain types of systematic conditions, such as diabetes, or those taking specific medications, may require more frequent cleaning. Typically insurance benefits are designed to cover two dental cleaning a year for healthy patients. For patients with periodontal disease separate benefits are applied to aim at arresting the bacterial infection. Periodontal benefits usually range from 30-80 percent. Your teeth, smile, attractiveness, ability to chew and enjoy food, and general sense of well being are dependent on our dental care team. It is worth the extra time and expense to keep your teeth for a lifetime.